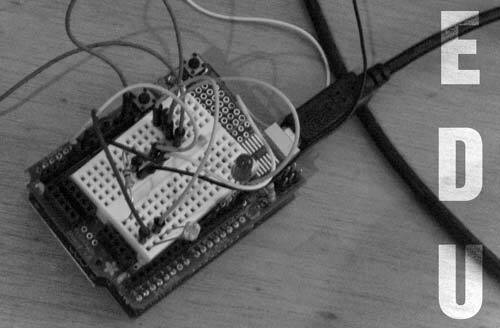 As you probably know, I’m a big fan of the Arduino microcontroller… Why? Well, for one thing, it’s fun. I’ve always enjoyed tinkering and building things, and when I was in school I did take electronics classes, and liked them. I’ve also been programming “things” forever, and while programming can be mundane, it can also be fun. So fun is great, but where does the learning come in? Well, the Arduino can (and should) have a place in education. In fact, the Arduino started in the education world, so to me, it makes sense to see it there. Steve Dickie is a teacher who is incorporating the Arduino into his teachings, and you can check out some of his work at Pre-Engineering: Electronics with Micro-controllers and the Arduino Education Blog. Besides being fun, I think the Arduino is a good choice because it’s open source hardware, supported by open source software, and it’s got a supportive community and ecosystem. I think open source should play a role in our schools for a number of reasons, not the least of which is the cost associated with many proprietary systems. I’ve seen schools implement solutions that are too costly, or over-engineered, or that get abandoned, or whatever… Open source could be a solution to some of these issues. Steve’s also got an "Open Source Microcontroller in Education" Kickstarter project going to take his project to a higher level. The project may or may not get funded, and Steve may or may not complete the project, but either way, I’m glad to see someone promoting (and using) open source in schools. Posted on Wednesday, April 27th, 2011 at 12:55 pm. Subscribe to the comments feed. Both comments and pings are currently closed. Post on your own blog. Thanks for the shout out. I’m still hopeful that I’ll make my goal, but I’m also realistic. I’ll still be working on my project whether I make my funding goal or not. The finished product may not look quite as professional, but I need to have something to keep me busy over the summer. Full details will end up on my web page.